This weekend we made Pancakes. Wonderful Pancakes that will be had over the next few days and then we'll find another way to cook them. You see, we have a griddle that fits two pancakes, one on each side, that is coated with a non stick surface. 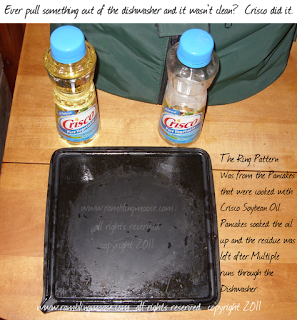 Before you cook, season that surface with an oil so they really do remain non stick. However, what happened was that picture that you see here. The Pancakes managed to soak up the oil, as expected, then left a ring pattern of leftover oil. The problem isn't the leftover oil. The problem is that after running these griddles through the dishwasher multiple times, the sludge leftover from the cooking process seemingly never leaves. We tried the same trick with the other side that is formed for Waffles, and had the same problem. In fact there were trace amounts of this sludge after more than 10 times through the dishwasher. We finally gave up and flipped it over to make Pancakes instead of Waffles after saying this has to be "normal" for this oil. I don't really understand what is going on here since the dishwasher is painfully hot. I may have to boil them to try to melt off this greasy ooze, but it isn't coming off with conventional methods of soap and water or dishwasher and Cascade. Maybe I am missing something really basic with the way I'm doing my cleaning but I seriously doubt it. That dishwasher is new-ish and otherwise is quite effective. This has led me to believe that the safest path is to use the rest of the Crisco Soybean Oil in the oil lamps we have around the house. If it is coating your pans and won't leave, imagine what it is doing to your inside. That creepy factor is why I won't be using the oil any longer. You have a picture above that is Cause and Effect. Despite the fact that the label says the only ingredient is Soybean Oil, it appears that there's something else going on. I may not be a scientist, but I will say that I'll vote with my feet next time. Bill, btw, I too have had a similiar situation arise, but mine was with a broiler pan. I sprayed pam on a broiler pan and then put on several chicken breasts. After cooking, the spots that were void of chicken had burned on pam on them. I scoured them with an sos and all was well after that, but I didn't want to scour in the 1st place that is why I used PAM!!!!! Crazy isn't it???? But don't use SOS on that griddle of urs.